A sophisticated Chinese restaurant serving both Cantonese and Szechuan dishes. 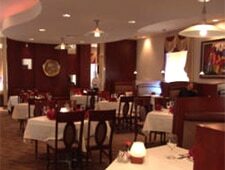 : Well-dressed staff offer a menu of both Cantonese and Szechwan dishes with an emphasis on seafood. We especially enjoy the spicy prawns with pepper salt, which are deep-fried but utterly greaseless. Other prime finds include the stir-fried scallops with asparagus and any of the steamed or sautéed fish dishes, which include black cod and grouper. There are ten soups, of which crab meat and fish maw is notable due to its complex layers of flavor. Among other unexpected items are roasted squab served golden brown, Peking duck prepared in two styles --- crisp honey glazed skin served with Chinese crêpes and boneless breast stir-fried --- and black mushrooms stuffed with shrimp mousse. This is by far the most ambitious Chinese restaurant in the metro area. Chef Peter Chan, who is also one of the principals, has 25 years experience in Hong Kong and Montréal.